Stagecoach Cumbria & North Lancashire will introduce a brand new fleet of 12 buses on the 555 route between Keswick and Lancaster next month. The launch will coincide with an increased timetable with more frequent services which start on the 3rd July 2016 and sees an investment of £2.5 million to providing sustainable travel throughout the region. The new fleet of buses will operate on the A591, one of the county’s most vital roads providing a cost-effective way of keeping local residents well connected between Keswick and Lancaster, which is essential for their daily commute. The new fleet of buses set to operate on the route are designed to look after the customer and provide a first class experience whilst traveling on one of the most scenic journeys through the Lake District..
Each bus comes complete with a striking new livery to promote the best of the Lakes. Italian designed luxury seating, free Wi-Fi, USB charging points, specially designed to be wheelchair and buggy accessible and includes a cleaner, greener engine to help reduce carbon emissions. Stagecoach invites the public to experience the new buses before they enter service and be in with the chance of winning free travel. On Thursday 30th June, a new bus will be parked in Kendal Market Square and on Friday 1st July at Waterhead Car Park in Ambleside and Booths Car Park in Keswick. “We are really excited about launching our new and enhanced vehicles which will continue to serve the local community who rely on bus services as part of their everyday commute. 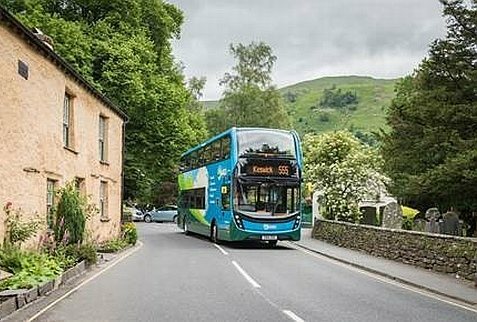 During the recent closure of the A591 between Grasmere and Keswick we have seen how vital the 555 route really is and the investment in12 brand new buses demonstrate Stagecoach’s continued commitment to the Lakes”.